Erin O’Brien puts up a shot during the first half against Upsala Thursday, Nov. 29, at home. Staff photo by Marguerite Laabs. The Lady Cubs tipped-off a new season on Tuesday, Nov. 27, with a 58-43 loss to a formidable Royalton Royals team. Bouncing right back on Thursday, the girls outlasted the Upsala Cardinals, 61-50. (Royalton Game): Kimball senior Ashley Schindele started things quickly, with a three-point bucket. 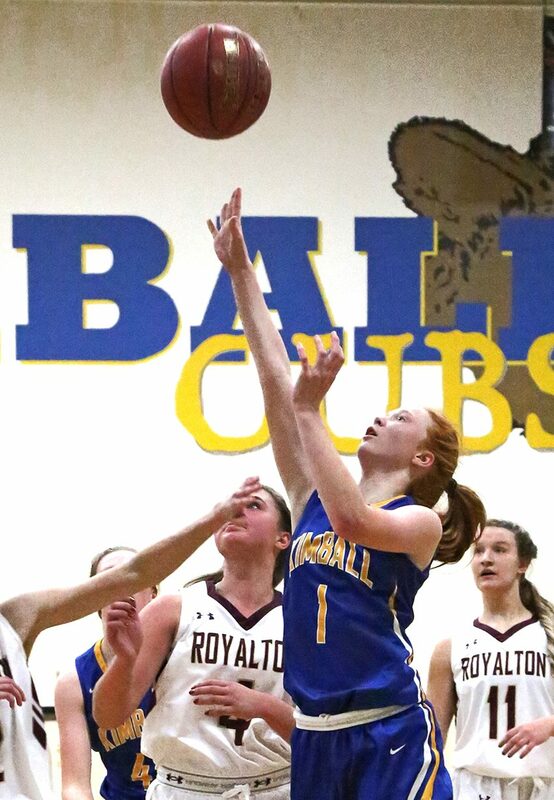 Royalton regained the lead and held it for most of the first half, but Schindele finished the first half the way she started it; connecting on two more treys, which left the Cubs down just two, 26-24 at halftime. Junior Cailyn Kuechle tied the game at 26 to begin the second-half scoring. With 12 minutes remaining, senior Rachel Utecht drilled a three pointer to make it a two-point game, but the Cubs failed in their valiant comeback-effort and ultimately suffered the loss. The Cubs’ Achilles’ heel was poor shooting (14 for 54 as a team). Moreover, they committed 22 turnovers, which proved too steep to overcome. Scoring line: Erin O’Brien, 12 points and 5 steals; Ashley Schindele, 11 points; Rachel Utecht, 6 points; Sidney Schreiner, 5 points; Madelyn Hunt, 4 points; Ellie Kuechle, 3 points; Cailyn Kuechle, 2 points. “It was a disappointing outcome. This is one of the better teams in our section, and I felt like we out-played them most of the game. But our low shooting percentage, despite pretty good shot selection decisions, and one bad stretch against their press–cost us dearly. However, the first game did show me a lot of positive things that we can build off of as well,” said coach Jeremy Kuechle. (Upsala Game): The Cubs hosted Upsala in the second contest of the week and Kimball was eager to start fast. Junior Cailyn Kuechle and seniors Erin O’Brien, Rachel Utecht, and Sidney Schreiner, all hit buckets in the first three minutes, to give the Cubs a 14-0 lead. O’Brien played well in the post, and dished out seven assists. She and Utecht scored 13 and 12 first-half points respectively; posting an intermission Kimball advantage of 36-21. However, Upsala kept the fans from leaving early, as they chipped away at the Cubs’ lead and cut it to 47-41 with circa five minutes remaining. But Schreiner’s second three pointer of the game pushed the lead back to nine and Kimball closed out the victory. Scoring Line: Erin O’Brien, 19 points, 11 rebounds; Rachel Utecht, 15 points, 7 rebounds; Cailyn Kuechle, 12 points, 4 assists; Sidney Schreiner, 8 points; Ashley Schindele, 3 points, 8 rebounds; Madelyn Hunt, 2 points; Ellie Kuechle, 2 points; Holly Berscheid, 2 rebounds. “We came out firing on all cylinders and played very well for some stretches; but we also went through some stretches where we need to make better decisions, and that’s part of the learning process so we will continue working to improve,” coach Kuechle remarked.